In a blog post on this website dated January 15, 2016 and titled “A Shocking Summary Statistic” I had noted that the prosecution of former Greek chief statistician Andreas Georgiou is an indication of the moral bankruptcy of the contemporary Greek ruling class— politicians, economists, civil servants, parliamentarians and the judiciary– in other words, of the members of the Greek “elite” that betrayed the ethical standards of their respective professions or public sector positions. During the first months of 2016 the issue languished in the Greek Supreme Court, as a lower court had recommended in mid-2015 a dismissal of charges about alleged manipulation of the 2009 deficit and damage of 171 billion euro to Greece, but a Deputy Prosecutor of the Supreme Court proposed in September 2015 an annulment of the acquittal. Then, on August 1, nine months after hearing of the case, the Greek Supreme Court returned the case to the lower court to reconsider whether Mr. Georgiou should face trial for the above charges. An international uproar followed, mainly in German and British newspapers. The Economist drew a parallel between Greece and the Soviet regime under Stalin and between Greece and the Central African Republic. Three European Commissioners stated that “for the Commission and Eurostat it is absolutely clear that data on Greek Government debt during 2010-2015 have been fully reliable and accurately reported to Eurostat.” Furthermore, the Commission called upon the Greek authorities to “actively and publicly challenge the false impression that data were manipulated during 2010-2015 and to protect ELSTAT and its staff from such unfounded claims”. In response to these statements an ambiguous response was provided by Alternate Finance Minister Chouliarakis, but the Eurozone governments decided not to put the issue on the formal agenda of the September 9 Eurogroup meeting, as originally planned, probably to avoid further confrontation and in the hope that the issue would be quietly resolved. Unfortunately, the Greek government did not follow the cue. Two days later, on September 11, Greek Prime Minister Alexis Tsipras still referred to the “dark aspects of this affair that raise question marks” and to Mr. Georgiou as “the defendant”. The Georgiou Affair has many parallels with the Dreyfus Affair in 19th century France, which deeply divided the French society and brought to the fore the rise of nationalism and antisemitism. Captain Dreyfus, a Jewish Army officer, was wrongly accused of espionage and it took 12 years and two trials for Dreyfus to be fully exonerated. 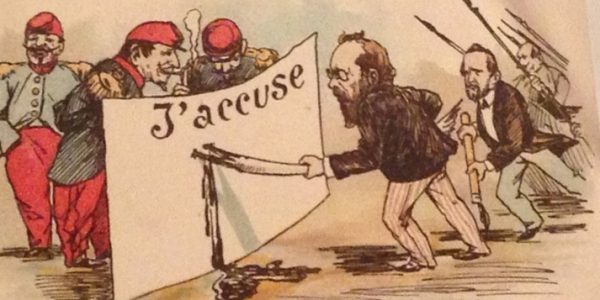 In the process, the Dreyfus Affair touched upon all aspects of French society, including the military, religion, diplomacy, cultural affairs, international affairs and the press. Émile Zola’s famous Open Letter “J’ Accuse!! !” in the daily L’ Aurore on January 18, 1898 became a symbol of intellectual integrity in the midst of intensified antagonism between the left and the right. Greece is in the midst of its worst economic crisis in the past 50 years and one of the worst in its history. It cannot afford to waste time, energy and resources in continuing to pursue a groundless case. In an article published in Sueddeutsche Zeitung on September 14, 2016 entitled “Prosecution or Persecution? The Outrageous Case Against Andreas Georgiou” I call upon Greece’s international creditors to set aside the false premise of separation of powers and ask the Greek government to put an end to the Georgiou Affair. You may read my article in English here. I agree with the British press. Only in totalitarian regimes you find this type of behavior. ELSTAT supposed to be independent from political influences. I do not know of any Greek organization reporting on government financial matters that has or had such independence. The reason behind the outrageous prosecution of Andreas Georgiou is the desire of Greek politicians to shift the blame for the crisis away from their own pathetic record of fiscal mismanagement to the technocrats who supposedly “inflated” the 2009 deficit and debt, leading the hated “Memoranda” with official creditors. Thanos is right to call on the creditors to take a tougher stance in support of Mr Georgiou, who is at risk for doing his job properly in a country where the judiciary is often guided by the party in power. I am really grateful for all who are engaged in this case, to Support Andreas Georgiou and the idea of Independent official statistics in a democratic Society. Maybe today more than one voice is needed to stopp the greek judiciary which seems to be far away from justice. The case shows how relevant is to have first class civil servants and to draw a well defined line to separate politics from public administration. Politicians must provide the objectives, civil servants must follow with diligence and independency.